Feb. 3, 1995, is a day Eileen Collins ’78 is unlikely to forget. It was on that day that Collins piloted the shuttle Discovery into outer space and into the history books all at once. Collins became the first female to pilot a shuttle mission. She was named a shuttle commander four years later. Collins can be considered a hero. NASA has bestowed nearly a dozen service awards on her. She’s a member of the National Women’s Hall of Fame. She even has a road in Syracuse leading to Hancock Airport named in her honor. In 1996, Collins was named the winner of a George Arents Award. 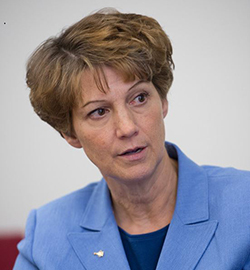 Eileen Collins Syracuse University Arents award from Syracuse University EMC on Vimeo.